One of the most enjoyable food dilemmas out there is what to put on your pizza. While there are no incorrect answers (like putting ketchup on a hot dog), chances are that not everyone is going to side with your anchovy, pineapple and garlic preferences. Sure, you can make pizza with one half topped one way, and the other half topped another way, but then you only have half of a pizza the way you really want it. Wouldn’t you rather just have the whole pie the way you want it? Or better yet, four of ‘em. 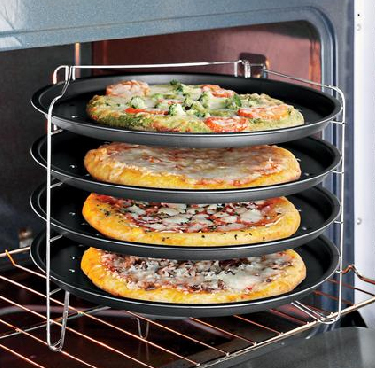 Okay, so this Pizza Pan Set is all about sharing and those four pies aren’t all going to one place (hopefully). No matter what you want on your pizza, with four pies in the oven, everybody is going to get a slice. If you’re lucky there may even be some of that anchovy special left over. Have a Heart—it’s Valentine’s Day!